We should all be paying extra attention to trees this time of year, and nurturing them before winter sets in. So, follow these fall tree watering tips! During fall, dry conditions can be more damaging than the cold itself. The air during Fall is colder and crisper and usually quite dry, and leading up to winter, late fall winds can even remove water from plants faster than the roots can absorb it. We should all be paying extra attention to trees this time of year, and nurturing them before winter sets in. Trees need water to flourish and to withstand the elements, and well-watered trees can reward us with strong growth and a canopy that provides shade for you, your landscape, and your home. Trees obtain water best when it can soak into the soil slowly to a depth of 12 inches. 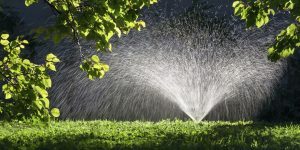 Methods of watering trees include sprinklers, deep-root fork or needle, soaker hose or soft spray wand. Apply water to many locations under the dripline and beyond if possible. If using a deep-root fork or needle, insert no deeper than 8 inches into the soil. As a general survival rule, apply 10 gallons of water for each diameter inch of the tree. Deeply watering trees leads to many benefits- it helps in the growth of deep roots that will make for stronger trees and shrubs that can handle storms, winds, extreme temperatures, drought, and disease. This resilience is ideal for the colder months to follow. If you’re uncertain of your soil type, then simply grab a handful of it and feel its texture. Sandy and loamy soils will feel dry, whereas soils composed of clay will be harder to break apart. Water travels fastest through sandy soil, and clay soils are found to be harder for water to pentrate. This is where mulch can save the day. A layer of mulch not only cools the soil but it helps greatly in the retention of water, and eliminates weeds that compete for water and nutrients. Watering Tips from Nelson Tree Specialist! This entry was posted on Friday, September 22nd, 2017 at 11:55 am. Both comments and pings are currently closed.